In this lecture, we discuss the validation of various numerical methods in structural topology optimization. This is done by computing numerically optimal topologies (e.g. for perforated plates in plane stress), using various numbers of ground elements and various volume fractions. Then the structural volume value is extrapolated for (theoretically) zero volume fraction and infinite number of ground elements, and this extrapolated value is compared with that of the analytical solution. 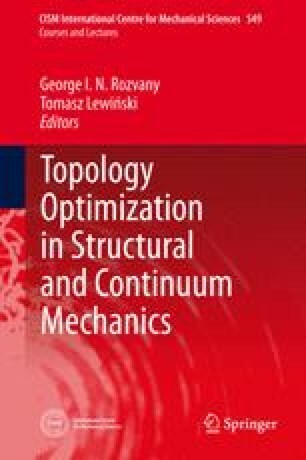 As a related subject, volume-increasing effect of topology simplification is also discussed. In the second part of the lecture new and highly efficient numerical methods are discussed, which are capable of optimizing truss topologies with up to over one billion potential truss elements, and thereby providing the verification of optimal volumes with an accuracy of up to four significant digits. The first author will present the first part of this lecture, and the second author the second part.